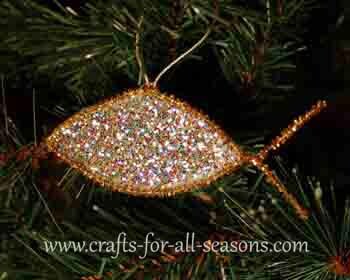 This Jesus fish ornament is a fun religious craft for children to celebrate the meaning of Christmas and symbolize the Christian faith. This project would be a perfect Sunday school craft. It really sparkles on the tree! You only need a few materials to make it.
" I am Alpha and Omega, the beginning and the ending, saith the Lord, which is, and which was, and which is to come, the Almighty." (King James Version). 1. 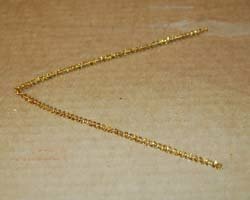 Begin by bending the pipe cleaner slightly in half, for form a "V" shape, as shown below. 2. 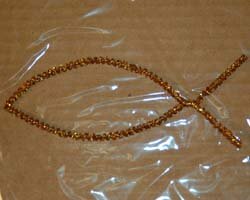 Next, bring the two ends together and twist them once or twice, about one inch from the ends, to form the Jesus fish shape. Place the Jesus fish on a piece of plastic wrap. Make sure you are working in a place where the fish can be left undisturbed for a few days. Or, place a piece of cardboard under the saran wrap so you can move the fish to an undisturbed location when you are finished. 3. Tie a cord around the top of the Jesus fish for hanging. Then, fill the entire inside shape of the Jesus fish with a thick layer of white glue. Make sure the glue is touching each side of the pipe cleaner. 4. Next, decorate the Jesus fish. 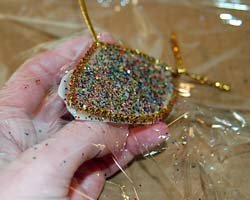 An easy way to decorate it is to sprinkle multi-colored glitter over the glue. 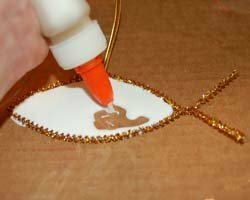 You could also place sequins in the glue, small gravel, beads, or pieces of construction paper. Be creative! Once the glue is dried you could also decorate the fish by coloring the inside with markers. 5. Now let it dry completely. This can take up to 3 days depending on how "thick" the glue layer was. When it is all dry, gently peel it off the plastic wrap. 6. Use scissors if necessary, to trim away any dried glue edges that seeped under the pipe cleaners. 7. Your ornament is ready to hang. 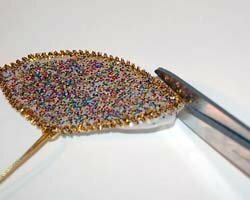 You'll love how it sparkles! 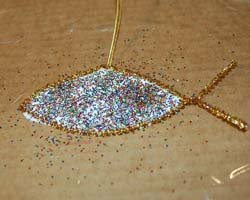 "Here's a few more ideas for this Jesus Fish ornament - shape the pipe cleaner for a clown fish (or any fish of your choice), fill center with glue and use different colored glitter in a stripe pattern for a more colorful fish. This is for those people who do not follow the Christian faith but would like a fish ornament for a mobile for example (seal glitter if hanging over a baby's crib). Why stop at fish shapes - use cookie cutters or other shapes to form outline with pipe cleaners, fill centers with glue and use the different colored glitters to fill in just as the sand art painters do, and once dry, what a beautiful craft of sun catcher you will have. (Might even make one to resemble a mandala). Endless ideas!" Response from Crafts For All Seasons: What great ideas Mary! Thank you for sharing.